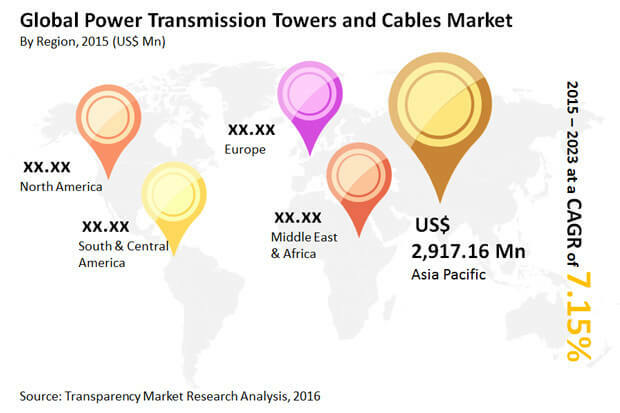 The global power transmission towers and cables market features a highly fragmented and a markedly dynamic operating environment, finds Transparency Market Research (TMR). Some of the leading vendors in the market are Kalpataru Power Transmission Ltd., Zhejiang Shengda Steel Tower Co., Ltd., Nanjing Daji Iron Tower Manufacturing Co. Ltd., ShanDong DingChang Tower Co., Ltd., KEC International, Ltd., and Sumitomo Electric Industries, Ltd. A large number of players operating in this fragmented landscape are capitalizing on emerging opportunities emanating from the spiraling demand for revamping old outdated grid infrastructures or from the increased implementation of smart grid technologies. The global power transmission towers and cables market stood at US$7.62 bn in 2014 and is projected to rise at a CAGR of 7.15% from 2015 to 2023. Expanding at this pace, the market is anticipated to reach a valuation of US$13.90 bn by the end of 2023. Regionally, Asia Pacific leads the market and is predicted to account for a revenue of 49.0% by the end of the forecast period. The growth of the regional market is primarily propelled by the increasing upgrade of conventional power transmission infrastructures in order to meet the intensifying demand for smart grid technologies. Based on type, the market for power transmission cables is anticipated to lead throughput the forecast period. This segment is projected to rise at a CAGR of 10.28%, in terms of volume, from 2015 and 2023, mainly driven by the demand for constant expansion of grid networks. The rising demand for electric power among residential, commercial, and industrial users, has led to the need for finding a reliable, sustainable, and affordable power transmission infrastructures. The rising demand for power transmission towers and cables world over is driven by the need for sustainable supply of electricity in a number of industrialized nations. The rapid pace of urbanization in various developing nations is catalyzing the demand for power transmission towers and cables. The mounting demand for integration of renewable energy sources into the existing grid infrastructures is a key factor driving the market. In addition, the vast inclusion of distributed power systems is anticipated to bolster the demand for power transmission towers and cables. The vast expansion of power grid system has led to the pressing need for replacements of cables and the demand for transmission towers. This is expected to accentuate the power transmission towers and cables market. Furthermore, a number of measures undertaken by several governments and private players implementing the smart grid technologies has boosted the market in developing and developed regions. Smart grid infrastructure has acted as a key enabler for flexible and high-performance power transmission system in numerous emerging economies. The advent of wireless transmission technologies to overcome the constraints of wired transmissions is a key factor expected to hinder the market to an extent. Nevertheless, the burgeoning demand of electric power in underground and submarine power transmissions is a key trend expected to open up exciting opportunities in the global power transmission towers and cables market. The growing shares of renewable energy in the existing power generation system is fueling the need for technologically upgrading the structure of in existing grid infrastructures. This has bolstered the demand for power transmission cables and towers in various regions. The pressing demand among policy makers world over to deliver on affordable power to commercial and industrial users has led to the vast expansion of renewable energy sources, thereby opening up lucrative avenues in the market. Furthermore, the growing number of activities in maintenance of transmission towers and the rising demand for upgrade services are crucial factors expected to catalyze the market.